3. How to test reminder (status bar notification and sound alarm)? 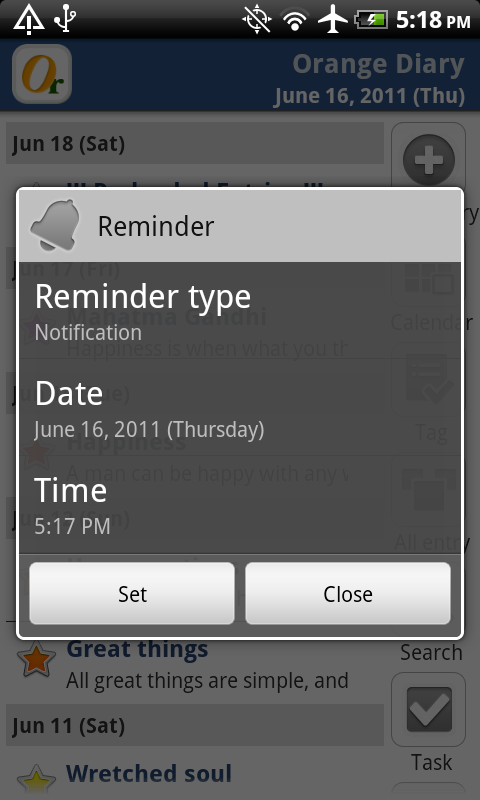 Step 4) Now, you see the reminder screen and current time is set as default.
. Time: one or two minutes after. Step 6) Press "Set" button. Step 7) Now, you are back in main screen and the entry you selected have little orange "Bell" shape icon. Step 7) Now, you are back in main screen and the entry you selected have little orange "Word balloon" shape icon. 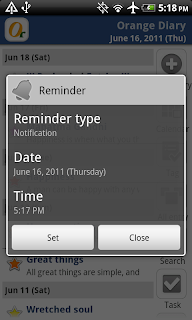 Step 8) Wait one or two minutes and check if the notification appears in the status bar on top of the screen.